For many, the transition from winter to spring marks the beginning of maple syrup season. Maple syrup can be made by collecting and boiling down the sap from maple trees. The Native Americans discovered this process hundreds of years ago, likely by accident. Legend tells of a chief, who after removing his tomahawk from a maple tree, set out for a day of deer hunting. When his wife needed to collect water for the evening’s venison stew, she found a birch-bark bucket full of “water” under the maple tree. She cooked the venison from the day’s hunt with the “water”, and produced the sweetest stew the chief had ever tasted. His wife had unknowingly used maple sap, which is as clear as water, and boiled it down into sweet syrup. This was the beginning of maple syrup. When Europeans arrived in North America, they learned from the natives about maple sap and syruping. The settlers set up sugar camps in the woods where the maple trees were most plentiful, and the trees were slashed with an ax to allow the sap to drip out and be collected. They eventually experimented with collection methods, drilling holes and using wooden spiles (spouts) and buckets. In the late 1800’s children were given a holiday from school to celebrate the sap run and to allow kids to help with the laborious process. The tradition of March maple syrup season is still alive. Collection and processing methods have evolved, although the fundamentals prevail. 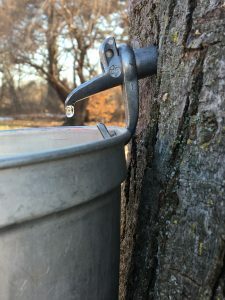 Sap starts flowing in maple trees when nights are below freezing and days are above freezing temperatures (ideally around 40° F). All Maples, including Boxelders, will make fine syrup. The difference lies in the sugar content of the sap. Sugar Maples have a much higher concentration of sugar in the sap, while box elders have the lowest sugar content. It takes roughly 86 gallons of sap to make one gallon of syrup from Boxelder sap! Maple syruping is a fun process that is not difficult and can be very rewarding. With a little research, patience, and planning you could have jars of syrup on your shelves for a fraction of the price you would pay at the store. This month, CNC has a wide variety of maple syrup programs open to the public. We invite you to join us in this fun, educational experience as we celebrate our heritage and the bounty of the natural world. Be sure to also check out the links below if you are interested in starting Maple syruping on your own.